The end of Daylight Savings Time is the perfect time to bring out Teddy Tells The Time. 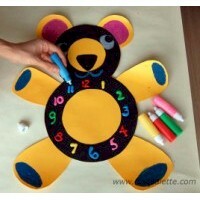 Teach the kids how to tell the time with Teddy with this creative clock craft. Always let your child use child-safe scissors. 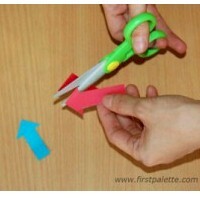 If you need to use sharper scissors at some point make sure that a responsible adult does that step. 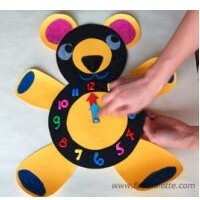 This teddy bear clock is two-toned so use two colors of your choice. 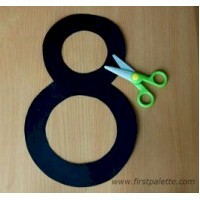 Draw and cut a number "8" on one color of construction paper. This will be teddy's body. 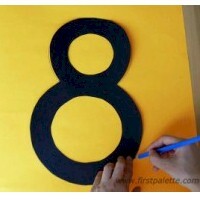 Trace the outer outline of the number "8" on the other color of construction paper. 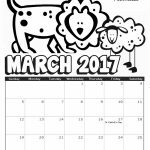 Using the number "8" as a guide, draw two circles on top to make teddy's ears, two arms and a pair of legs on teddy's body. Cut out the teddy bear. 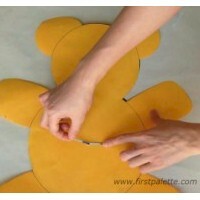 Apply glue on the number "8" and stick it on top of the teddy bear, making sure it is properly aligned with the teddy bear's body. 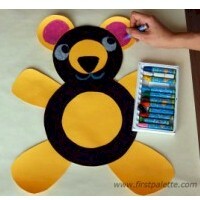 Use crayons to add details on your teddy bear: two round eyes, a nose, and a mouth. Each ear should have a half-circle like any teddy bear. 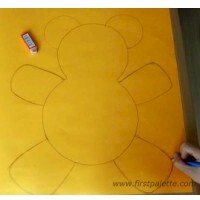 Draw an oval on each arm and leg. Don't forget to color inside each oval. Our teddy bear's complete but remember we need to make a clock. Write the numbers 1 to 12 on the circle around teddy's tummy. You can use crayons, felt tip pens, puffy paint or glitter glue. If you want the numbers to be accurately positioned like a real clock, you can mark the correct spots first with a pencil before drawing or painting on the numbers. Draw and cut two arrows on construction paper. These will be the clock's hands so one arrow should be longer than the other. 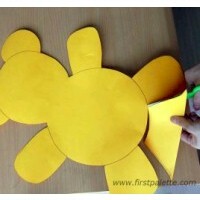 Align the arrows and use a hole punch to make a hole near the base. 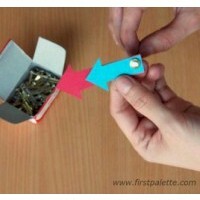 Insert a round paper fastener through the hole. Use a pencil to punch a hole at the very center of teddy's tummy. Insert the ends of the round paper fastener through the hole. Split the two ends of the fastener at the back. Now you're ready to learn the time with teddy. Can you tell what time it is? Move the arrows around to change the time.